The visual arts can be explored in two ways: through the hands-on practice of skills and techniques in a variety of mediums, or through an in-depth study of art’s history and meaning. At Sweet Briar, the visual arts major has two tracks: history and image, and studio art. The history and image track provides students with an understanding of art and architecture in a cultural context. Students will be introduced to the means by which art can be critically observed, intelligently analyzed and knowledgeably discussed. Inherently interdisciplinary, the study of history and image touches not just art and history, but also philosophy, literature, music and anthropology.Rooted in research, exploration of art history deepens academic skills that are fundamental to the liberal arts. The studio art track helps students develop practical skills and the ability to access their creativity. Students have the opportunity to master a wide range of classic and experimental techniques by creating visual expressions of ideas drawn from their own experiences and enriched by the broad spectrum of knowledge available to them in the liberal arts program. What is distinctive about studying visual arts at Sweet Briar? Sweet Briar has an impressive collection of art right on campus in its three galleries. As a teaching collection, the art is fully accessible to students and faculty. Students have the opportunity to curate their own exhibitions. President Woo’s Living with Art initiative allows students to choose a piece of art from the permanent collection for their rooms. Our rigorous capstone experience for studio art seniors is a group exhibition in a Sweet Briar gallery. Much of the artwork for the senior art exhibition is generated for Senior Seminar, a critique forum for majors. The experience incorporates training in all aspects of the students’ senior show — from preparing their work to designing the invitations and collaborating with the catering department. An outside art professor or professional artist attends the exhibition to lead an oral defense and discussion of the students’ work. 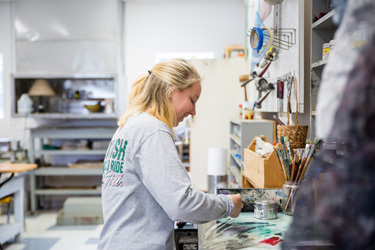 Students benefit from Sweet Briar’s partnership with the neighboring Virginia Center for the Creative Arts, an internationally renowned artists’ colony for the visual, literary and performing arts. Majors regularly travel to museums and galleries in Richmond, Washington, D.C., and New York. These trips are a critical part of developing engaged global citizens. Students may choose to study European art history in our JYF program. What can you do with a degree in visual arts? In addition to pursuing a career as an artist, studio art graduates can teach, work in design, art therapy, advertising, web design, art journalism, publishing or art auction houses and galleries. The skills gained from the study of history and image allow majors to work in or outside the field. Graduates can be found in law, international policy, NGO administration — and even medicine. Sweet Briar visual arts graduates work at museums in Boston, Charlotte, Washington, D.C., New York, Richmond and Florence, Italy, in every area from curating to administration. They are also teaching and running art galleries. Many visual arts graduates pursue graduate work.